Nice farming estate dating back to 19th century recently restored and turned into 4 comfortable apartments. 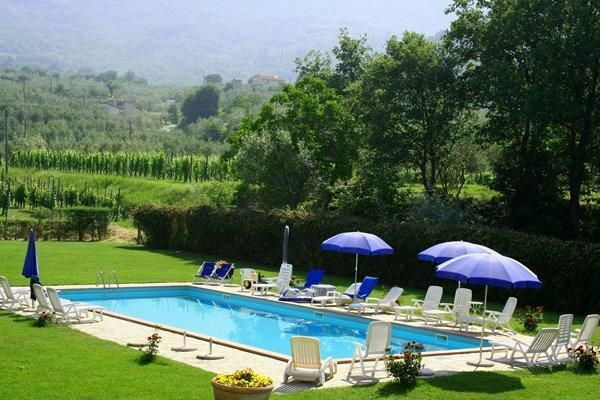 This property is situated near the town of Castelfranco di Sopra, in quite location and offers beautiful views over the surrounding landscape and the Valdarno region. All of the apartments are provided with a personal outdoor equipped area. Distances: Castelfranco di Sopra with all kinds of shops 1,5 km away, Figline Valdarno 8 km, Arezzo 44 km, Florence (airport) approx. 40 km. At guests’ disposal: large furnished garden, shared swimming-pool (16 x 6 – maximum depth 1,5 m – open from 01/05 to 30/09), barbecue, playground for children. Parking within the property. Extra services: baby bed available on request at € 30,- / per week (to be paid locally). Swimming pool towels available at € 5,- / per person / per week (payment on site). Maid service available by arrangement (to be paid locally). Small pets are allowed by paying an extra charge of € 35,- / per pet / per week (to be paid locally). 90 m2. Ground floor: living-room (TV) with fireplace and double sofa-bed, kitchen corner (oven, freezer, dishwasher) and dining area, bathroom with shower (washing-machine). 1st floor: double bedroom, twin-bedded room, bathroom with shower. Personal outdoor equipped area. Additional costs paid on site: Security deposit: € 200,-Final cleaning: € 50,-Heating: according to consumption.